Say YES to being honest about where you are during this holiday season. Whether experiencing really high highs or really low lows, it's time for us to adjust our routines, so we stay as happy and healthy as we can be throughout this season. Whether finances, stress, anxiety, or grief, it's time to make some adjustments and embrace your right now with the hope and gratitude you deserve. Come-on-in The Healing Room where we heal and elevate together. Shop: YourHealingRoom.com Become a Patron: anchor.fm/thehealingroom Booking/Contact: MC@MCWrites.com Blog: goo.gl/hkZV7b Website: MCWrites.com Let's connect on Instagram: goo.gl/ve6bYt The Healing Pledge: Begins at 2:20 Health Issues: Begins at 4:30 Anxiety: Begins at 5:20 Over Committing: Begins at 10:05 Being Known By God: Begins at 18:40 Don't forget to visit the store at YourHealingRoom.com - all dedicated to your self-care healing with products curated to aid in insomnia, anxiety, and more! Shopping here is a great way to support The Healing Room. Always consult a doctor for your medical needs. May your life be forever blessed. 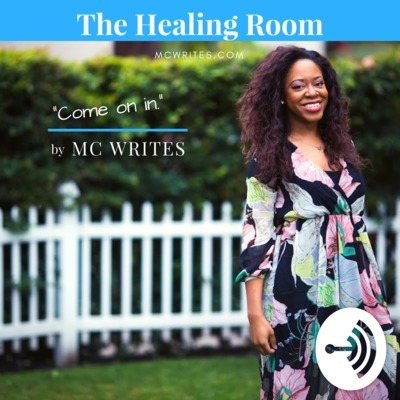 - MCWrites.com This episode includes topics on depression, healing, anxiety-relief, wholeness, people pleasing, , gift giving, over-spending, financial struggles, Christmas, holiday stress, and being known to name a few. Today's discussion is a deep dive on one action that increases productivity, focuses on purpose, and helps us overcome all distractions. This is a powerful discussion, especially for leaders, entrepreneurs, and all of those who seek to fulfill a God-given purpose within their lives. Come-on-in The Healing Room where we heal and elevate together. YourHealingRoom.com Become a Patron: anchor.fm/thehealingroom Booking/Contact: MC@MCWrites.com Blog: goo.gl/KWfhgf Website: MCWrites.com Let's connect on Instagram: goo.gl/ve6bYt Spoken Word: Begins at 1:10 The Healing Pledge: Begins at 2:20 Principles That Produce Promise: Begins at 11:05 The God of Right Now: Begins at 14:40 Don't forget to visit the store at YourHealingRoom.com - all dedicated to your self-care healing with products curated to aid in insomnia, anxiety, and more! Shopping here is a great way to support The Healing Room. Always consult a doctor for your medical needs. May your life be forever blessed. - MCWrites.com This episode includes topics on faith, family, Christianity, healing, anxiety-relief, wholeness, finding purpose, God, contentment, Jesus Christ, Biblical text, and overcoming obstacles to name a few. Today's discussion is all about gratitude and thankfulness. Together we touch on a few racial and painful components of our nation's history as we find a deeper reason for thankfulness this holiday season. Come-on-in as we heal and elevate together. YourHealingRoom.com Become a Patron: anchor.fm/thehealingroom Booking/Contact: MC@MCWrites.com Blog: goo.gl/Zm93AS Website: MCWrites.com Use the hashtag #BTheLion if this series resonates with you. Let's connect on Instagram: goo.gl/ve6bYt Spoken Word: Begins at 1:05 The Healing Pledge: Begins at 2:45 Thankfulness: Begins at 3:31 Don't forget to visit the store at YourHealingRoom.com - all dedicated to your self-care healing with products curated to aid in insomnia, anxiety, and more! Today's discussion is a deep dive on identity and how it shapes life, purpose, and priorities. Together we identify the distractions in our lives that may be blinding us from the fruitfulness we long for. Could it be that there is a blessing in your midst but a distraction is keeping you from seeing? Come-on-in The Healing Room where we heal and elevate together. YourHealingRoom.com Become a Patron: anchor.fm/thehealingroom Booking/Contact: MC@MCWrites.com Blog: goo.gl/PD7qaK Website: MCWrites.com Use the hashtag #BTheLion if this series resonates with you. Let's connect on Instagram: goo.gl/ve6bYt Spoken Word: Begins at 1:05 The Healing Pledge: Begins at 2:48 Know What You Have: Begins at 3:31 The Story of Jacob & Rachel: Begins at 4:00 Discovering Your Fruit: Begins at 12:00 Is There A Lion In You? : Begins at 26:30 Don't forget to visit the store at YourHealingRoom.com - all dedicated to your self-care healing with products curated to aid in insomnia, anxiety, and more! Musical Intro: Special thanks to Bensound.com Poetic Musical Accompaniment: Special thanks to Daniel Birch "Slowly Drift Away"
This discussion is a unique approach to looking at time and how we can find freedom and fruitfulness in the time we have. Let loose the anxiety, stress, or defeat and join us in this opportunity to see time and life in a whole new light. Come-on-in The Healing Room where we heal and elevate together. YourHealingRoom.com Become a Patron: anchor.fm/thehealingroom Booking/Contact: MC@MCWrites.com Blog: goo.gl/mXrGsV Website: MCWrites.com Use the hashtag #BTheLion if this series resonates with you. Let's connect on Instagram: goo.gl/ve6bYt Spoken Word: Begins at 1:55 The Healing Pledge: Begins at 2:55 Don't forget to visit the store at YourHealingRoom.com - all dedicated to your self-care healing with products curated to aid in insomnia, anxiety, and more! All Rights Reserved Always consult a doctor for your health needs. Topics of this episode include finding freedom, self-care, time, self-love, healing, depression, anxiety, defeat, age, insomnia, sleep, and rest. This discussion is summed up by its title. Together we walk through the realities of stress, anxiety, worry, doubt, and fear to uncover our trigger. We then acknowledge and rediscover the value in peace of mind and how very obtainable it is - as well as life-changing. This may be the most important podcast discussion you hear all year. Come-on-in The Healing Room where we heal and elevate together. YourHealingRoom.com Become a Patron: anchor.fm/thehealingroom Booking/Contact: MC@MCWrites.com Blog: goo.gl/mXrGsV Website: MCWrites.com Use the hashtag #BTheLion if this series resonates with you. Let's connect on Instagram: goo.gl/ve6bYt Spoken Word: Begins at 1:20 The Healing Pledge: Begins at 2:20 Don't forget to visit the store at YourHealingRoom.com - all dedicated to your self-care healing with products curated just for you! All Rights Reserved Always consult a doctor for your health needs. Topics of this episode include anxiety relief, stress, anxiety disorder, depression, fear, mental illness, self-doubt, worry, hopelessness, and peace. Today's discussion is a deep dive on what it means to find balance in our life for the joy, self-care, and peace we deserve. Together, we dissect the transactions in our lives that may be creating a deficit or positive. We then can use this information to discover the areas that are depriving us of the peace we so rightfully deserve. Come-on-in The Healing Room where we heal and elevate together. YourHealingRoom.com Become a Patron: anchor.fm/thehealingroom Booking/Contact: MC@MCWrites.com Blog: goo.gl/bxJyma Website: MCWrites.com Use the hashtag #BTheLion if this series resonates with you. Spoken Word: Begins at 1:00 The Lion: Begins at 2:40 The Healing Pledge: Begins at 3:20 Don't forget to visit the store at YourHealingRoom.com - all dedicated to your self-care healing with products curated just for you! All Rights Reserved Always consult a doctor for your health needs. Today we're getting back to basics with our self-care practice and are keeping it simple and practical. Every now and then it's great to take a personal look at how we can create great opportunity by making little shifts. This is a fun discussion on self-care, so come-on-in the Healing Room where we heal and elevate together. YourHealingRoom.com Become a Patron: anchor.fm/thehealingroom Booking/Contact: MC@MCWrites.com Blog: MCWrites.com/Blog Website: MCWrites.com Spoken Word: Begins at 1:02 The Healing Pledge: Begins at 1:40 Getting Practical: Begins at 6:30 Your Routines: Begins at 8:40 Self-Care Ideas: Begins at 22:50 Don't forget to visit the store at YourHealingRoom.com - all dedicated to your self-care healing with products curated just for you! All Rights Reserved Always consult a doctor for your health needs. Today's discussion is a short and sweet story on how unbelief is crippling, the importance of knowing your purpose, and the truth about the in-between journey of getting there. Come-on-in The Healing Room where we heal and elevate together. YourHealingRoom.com Become a PATRON: anchor.fm/thehealingroom Booking/Contact: MC@MCWrites.com Website: MCWrites.com Instagram: goo.gl/ve6bYt Spoken Word: Begins at 2:10 The Healing Pledge: Begins at 3:50 Investing in Purpose: Begins at 5:30 Sticking With Purpose: Begins at 7:45 Purpose-oriented Resources: Begins at 9:40 Questions You Must Answer: Begins at 16:10 Beautiful Expectations: Begins at 19:40 Thanks for listening! Let's connect on Social Media! Instagram @MC_Writes LINK: goo.gl/ve6bYt Consult a doctor for all your medical needs. Today's episode is about the realities of stress and the value of self-care healing. This discussion is a deep dive on how stress affects the mind, body, and soul, but how we have a choice to reprioritize our lives, so we aren't left out of our own stories. Today we do a check-in on how to self-care and the grand opening of YourHealingRoom.com on Oct 1, 2018, with products dedicated to your self-care healing journey. Today, we take space to be open and unapologetic about our health. Come-on-in The Healing Room where we heal and elevate together. YourHealingRoom.com DONATE: anchor.fm/thehealingroom Booking/Contact: MC@MCWrites.com Blog: goo.gl/Jivwqq Website: MCWrites.com Spoken Word: Begins at 1:8 The Healing Pledge: Begins at 2:30 Noticing Stress: Begins at 3:30 High Blood Pressure: Begins at 8:50 Irritable Bowel Syndrome/ IBS: Begins at 9:35 Self-Care Healing: Begins at 14:50 Always consult a doctor for your medical needs. Today's discussion is a holistic look at the importance of your right now journey. We discuss looking at why it's important to exhale and enjoy the life you are given today and how that can exponentially increase your opportunities for tomorrow (while also decreasing stress and anxiety). Come-on-in The Healing Room where we Heal and Elevate together. YourHealingRoom.com Booking/Contact: MC@MCWrites.com Blog: goo.gl/v3Amnu Website: MCWrites.com Words of Affirmation: goo.gl/ve6bYt Share comments/questions: MCWrites.com/contact Spoken Word: Begins at 1:36 The Healing Pledge: Begins at 2:40 Knowing Your Birthright: Begins at 4:20 The Beauty of Life: Begins at 7:35 Focusing on What Matters: Begins at 5:27 Contentment: Begins at 7:55 Mathew 6:34 Worry and Anxiety: Begins at 8:25 Breath of Life: Begins at 10:50 Anxiety, Depression, Stress: Begins at 18:45 Schedule a consult: mcwrites.com/schedule-consultation.ht *Always consult a doctor for your medical needs. 16: Self-Reflection Self-Love & Self-Respect: Extended Vs.
13: Are You A Restless Wanderer?